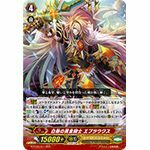 [ACT](VC)[1/Turn] Brave (This ability is active when you have three or less cards in your hand):[Counter Blast (1) & Soul Blast (1) & Choose a face down card from your G Zone, and turn it face up] Search your deck for up to the same number of grade 2 cards as the number of face up cards named "Equilibrium Divine Knight, Clotenius" in your G zone, call them to separate (RC), shuffle your deck, and until end of turn, this unit gets "[CONT](VC) Generation Break 3:If the number of your rear-guards is five, this unit gets [Power]+10000/[Critical]+1.". 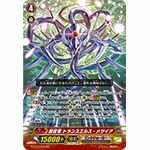 [AUTO](VC) Generation Break 2 Oracle (This ability is active when you have five or more cards in your hand):[Counter Blast (1) & Soul Blast (1) & Choose a face down card named "Heavenly Deity of Guidance, Wakahirume" from your G zone, and turn it face up] When this unit attacks a vanguard, you may pay the cost. 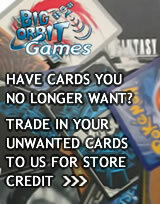 If you do, draw a card, choose a card from your hand, and put it on the top of your deck. [AUTO](VC)[1/Turn]:[Counter Blast (1) & Choose a face down card from your G zone, and turn it face up] When this unit attacks, you may pay the cost. 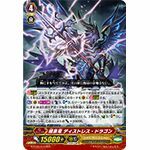 If you do, choose the same number of your rear-guards as the number of face up cards named "Meteokaiser, Bustered" in your G zone, and [Stand] them. 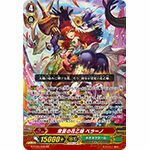 If two or more units were [Stand], and you have five rear-guards, until end of that battle, this unit gets "[AUTO](VC):[Counter Blast (1) & Choose two cards from your hand, and discard them] At the end of the battle, you may pay the cost. 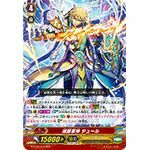 If you do, [Stand] this unit, and it gets drive-2 until end of turn.". 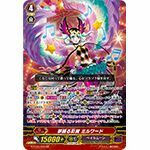 [AUTO] Generation Break 2:[Counter Blast (1) & Choose a face down card named "Genesis Dragon, Trancels Messiah" from your G zone, and turn it face up] When this unit is placed on (VC), if you have a heart card with "Messiah" in its card name, you may pay the cost. If you do, lock all rear-guards of all fighters, and unlock all locked cards other than the cards locked with this effect. Magia-[ACT](VC)[1/Turn] Generation Break 2:[Soul Blast (1) & Choose a face down card from your G zone, and turn it face up] Choose up to two cards from your soul, call them to separate (RC), they get [Power]+4000 until end of turn, and at the end of that turn, put the unit called with this effect into your soul. 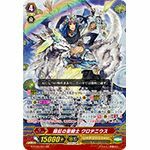 Choose the same number of your units as the number of face up cards named "Dreamiy Axel, Milward" in your G zone, and until end of turn, they get "[AUTO](VC/RC):When this unit's attack hits a vanguard, choose up to one card from your soul, and call it to (RC) with a unit". Time Leap-[ACT](VC)[1/Turn]:[Counter Blast (1) & Soul Blast (1)] You may choose a face down card from your G zone, and turn it face up. Choose up to the same number of your rear-guards as the number of face up cards named "Interdimensional Dragon, Warp Drive Dragon" in your G zone, time leap them, choose one of your opponent's rear-guards with grade equal to or less than the number of cards time leaped with this effect, and your opponent puts that unit on the bottom of his or her deck. 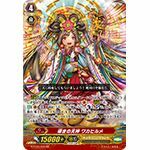 [ACT](VC)[1/Turn]:[Counter Blast (1) & Choose a face down card from your G zone, and turn it face up & Choose a card from your hand, and discard it] Choose up to the same number of normal units from your drop zone as the number of face up cards named "Demonic Sea Empress, Mairead" in your G zone with the sum of their grades being 4 or less, call them to separate (RC), and increase this unit's [Power] by the sum of the original [Power] of the units called with this effect until end of turn. [AUTO]:[Soul Blast (1) & Choose a face down card from your G zone, and turn it face up & Choose a card from your hand and drop zone, and return them to your deck] When this unit is placed on (VC), you may pay the cost. 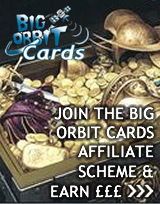 If you do, choose up to two cards from your hand, call them to separate (RC), choose the same number of your rear-guards as the number of face up cards named "Flower Princess of Everlasting Summer, Verano" in your G zone, search your deck for up to one card with the same card name as each of those units, call them to separate (RC), shuffle your deck, and the units called from your deck with this effect get "boost" until end of turn. 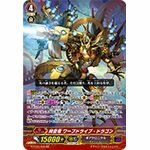 [ACT](VC)[1/Turn]:[Counter Blast (1) & Choose a face down card from your G zone, and turn it face up] Until end of turn, this unit gets "[CONT](VC):If you have a face up card in your damage zone, all of the rear-guards in your front row get [Power]+3000. 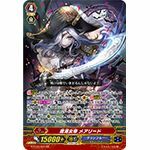 If you have five cards in your damage zone, this unit gets [Power]+10000.". 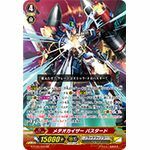 [ACT](VC)[1/Turn]:[Counter Blast (3) & Soul Blast (3) & Choose a face down card from your G zone, and turn it face up] Choose any number of your rear-guards, and retire them. Your opponent chooses the same number of his or her rear-guards as the number of your rear-guards retired with this effect, and retires them. If the sum of units retired with this effect is six or more, draw two cards, Counter Charge (1)/Soul Charge (1), and this unit gets [Power]+20000 until end of turn. [AUTO]:[Counter Blast (1) & Soul Blast (1)] When this unit is placed on (VC), you may pay the cost. If you do, look at two cards from the top of your deck, search for up to one card from among them, call it to an open (RC), and put the rest on the bottom of your deck in any order. 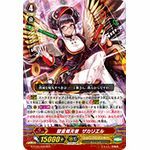 [ACT](VC)[1/Turn]:[Soul Blast (3)] Look at the top card of your deck, put it on the top or bottom of your deck, and until end of turn, this unit gets "[AUTO](VC):When your drive check reveals a grade 1 or greater card, you may Soul Charge (3). ".